It seems like nearly everyone has considered the trucking lifestyle at one point or another. For me, it started back when I was just 4 or 5 years old. I can still distinctly remember looking out the window of our old family van on road trips, wondering what it must be like to drive those big trucks. Where are they going? What are they hauling? What is it like to span the entire country in less than a week - and then do it all over again? Why do they look so darn cool? There was something so mysterious and romantic about truck driving. Of course, as a kid, I was more than a decade away from being able to drive a big rig. So to whet my appetite in the meantime, I'd play with my toy trucks on the living room floor. Well, that was until I discovered a Radio Flyer wagon tied to the back of a Schwinn bicycle was much more realistic! Yep, I was hauling around cargo (anything I could find in the garage) with no destination in mind. I was just a kid having a blast pretending I was a trucker. If you're interested in truck driving, chances are you have childhood memories like that, too. But my life, like the lives of so many others, took a different path. Somehow the dream faded. I stopped thinking about truck driving entirely. Instead, I followed the path that was laid out before me, just like all the other kids where I grew up. It was a path that took me in the opposite direction of truck driving. The end result? I became a truck driver anyway. In late 2008, I was laid off from my job. No more income and no more security. And that was during the worst economy since the great depression. Panic time! What was I to do? Luckily, I remembered my childhood dream. I was certainly qualified and the timing was right. Am I crazy enough to do it? Do I take that leap? After quite a bit of research, I decided to go for it. That ended up being the best decision I've ever made for myself. I now know that I'll never go back to a corporate office job ever again. But not everyone gets into trucking because of a layoff or because it was some dream of theirs as a child. In fact, some people don't even consider it until they are well into adulthood while holding perfectly stable jobs. A huge number of truck drivers are retirees or those who just want to experience the unique lifestyle. Some see it as an opportunity to travel the country and better yet, get paid to do it. I've met everyone from high school dropouts to former dentists and commercial pilots. Everyone has their own unique reason for trucking. One thing to remember is that truck driving is not a job. It's a lifestyle. You will work long hours and be away from home for about 3 to 6 weeks at a time. The money isn't terrible, but it isn't great either, especially considering the number of hours you'll be expected to work. This should not be a "last resort" type of job. If you do this for the money and do it because you simply need a job, you're setting yourself up for a big disappointment. This has to be a lifestyle you truly want. A challenge you're ready for. And an experience you crave to have. If the lifestyle sounds like your cup of tea, then get ready for a wild ride. Get ready for that first day behind the wheel while your leg shakes from nervousness. Get ready for your first mountain pass with 80,000 pounds pushing you downhill. Get ready to see some of the most beautiful sights in the world as well as some of the most rundown parts of our major cities. Get ready for independence and solitude. Get ready to meet some incredibly unique people in some even more incredibly unique places. 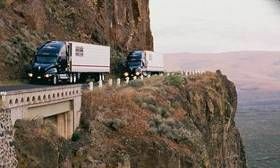 This is truck driving. It's a crazy lifestyle, but it might just be the change you're looking for.